Our friendly account management teams offer expert advice on the best products for your business needs. We do the small stuff; chairs, desks & the rest. We do the big stuff too; ceilings, flooring & refurbs. How does a 25% annual saving sound? Our free cost saving analysis could reduce your office expenditure. It’s a beautiful world. We do our best to keep it that way. We’re happy to apply an ISO14001 policy ? Who says you can’t have practical AND stylish? For every sector, for every workspace & for every budget. From product launches to corporate hospitality events, we’ve got a product with your name on it. We’d ? to hear from you! Why not drop us a line and see how we could help with your business needs? From retail, healthcare, leisure, hospitality and more, we’re experienced suppliers for every industry. From cleaning products and catering utensils to sanitary refills, we supply your everyday essentials. However weird or wonderful your request, our knowledgeable advisors have an extensive supplier for all your business needs. We continually strive to make a positive contribution; investing in & supporting our local communities. Want to know more about the benefits and cost saving of in-house printing? Check out our case study for Tangle Teezer here. We’re the largest business supplier in the North West with plenty of knowledge and experience to boot! Whatever the brief, whatever the budget, we can help with print and promotion from design to completion. Would you like a competitive quote on your print requirements? Request a quote online. Simple and straightforward. From replenishment and repairs, explore the benefits of MPS; supplies, maintenance and service savings. From pop-up banners to mounted displayed, with our input you can steal the show at events and expos! Our high quality uniforms carry your brand right across your workforce, with corporate clothing for all industries. Take your brand out on the road; be recognisable, build your profile & raise awareness wherever you go. Workwear & personal protective equipment – the smart way to keep your team safe and look great too! We’re proud to say our MPS division has Gold Concessionaire status with Xerox global partner programme. More than a supplier, more than a contractor, we’re a trusted partner, going beyond office supplies. We’re the company customers rely on, providing total business solutions. 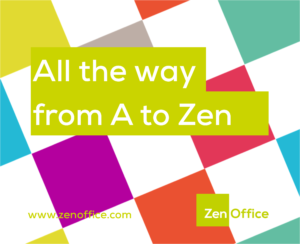 All the way from A to Zen ?